Parsnips are one of those intimidating root vegetables. They’re not exactly in the same category as celery root or kohlrabi, for example, but they do carry a hint of intimidation in them. They look like carrots, in fact, they’re cousins. Parsnips are much sweeter, however and even nutty in flavor. And they often sit in heaps at farmers’ markets, waiting to be picked up, cooked up, eaten! In lieu of getting our CSA delivered, the past several weeks, my husband, Claire and I have made the 1 hour trip to Blooming Hill Farm. They have a heavenly farm stand. Let me reiterate: HEAVENLY! It’s a beautiful farm with beautiful and abundant produce. They also have eggs, non-homogenized milk, cheese, freshly baked breads, the list goes on. On top of that, they have a little cafe area where a chef prepares simple fare (frittatas, pizza) with the bounty from the farm. It was on one of these trips that I picked up everything that went into this soup. I can’t deny that I get a sense of utter joy knowing that my entire dinner (or breakfast or lunch) came from an organic farm 1 hour away from where I live. We’re very lucky. So, while parsnips are busy intimidating some cooks, they’re also intimidating to inflammation and cancer thanks to the anti-oxidants they have. They are good sources of Vitamin C (another more famous anti-oxidant and water soluble vitamin), rich sources of the B-complex vitamins, especially folic acid (pregnant mamas, take note!) as well as a number of minerals. According to Rebecca Katz, “ounce for ounce, boiled parsnips have about 31% as much calcium as milk”.¹ (Great for vegans and vegetarians and any lactose-intolerant peeps to know. There are MANY non-animal sources of calcium!) Lastly, parsnips are another wonderful source of dietary fiber which is necessary for a healthy gut and colon. A quick note before we get to the recipe. Parsnips are quite bold in flavor and can easily take over any dish. I used fingerling potatoes and the herbs as a way to balance the parsnips out. I think you’ll love it! 1. In a medium or large saucepan, heat olive oil over medium heat. Add onions and cook for 5 minutes before adding celery and carrots. Season with sea salt. 2. When mire poix (remember that’s the onion, celery and carrots in a 50/25/25 ratio) is tender, add parsnips and potatoes and season again with a little salt. Deglaze with a 1/4 C of the water or stock and continue cooking for a few more minutes. 3. When all those veg are sufficiently mixed together, add the water/stock and the bouquet garni. Bring to a boil over high heat and then reduce to medium-low, add rolled oats and partially cover. 4. Cook for about 30 minutes or until the parsnips and potatoes are very tender. Remove the bouquet garni and take saucepan off the heat to settle for 10 minutes. In the meantime, set up your blender and have a kitchen towel handy. 5. One ladleful at a time, carefully place hot soup in an even amount of veg and liquid into the blender. Blend on high until ultra creamy. Repeat this process until the soup is done. Be sure to use the hand towel to hold the lid of the blender because the steam will lift the lid. 6. Return the soup to the saucepan and place over low heat. Add the lemon juice and let warm for a couple of minutes. Do a last minute check on flavor and add salt and/or pepper as needed. 7. 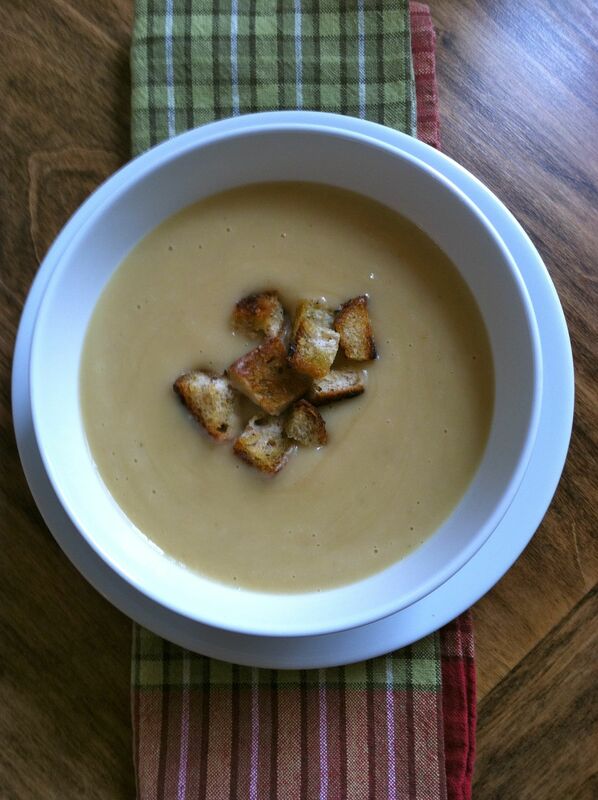 Ladle soup into individual bowls and top with fresh, warm, crunchy croutons! It’s a mystery how our little gourmands work. If only they could talk and tell us how they feel and what they feel like eating. I’ve run into many moms at the supermarket, the farmers market, at yoga, where this is a hot topic of conversation yet everyone leaves with a question mark still sitting in their heads. I know their frustration. There isn’t a ton of (good) information on what to feed babies, how much and when. What there is, is often contradicting. What are we newbie moms to do? We are left to our own devices and instincts to introduce our babies to the world of food. It’s a big task! Giving our babies a sound nutritional foundation from which to spring is key to their health for the rest of their lives*. We are responsible for setting a good example. You’ll definitely think twice about having that danish for breakfast when you’ve got a little one beckoning for some of your food! Parenting is the most reflective practice I’ve experienced yet. Contrary to what we adults may think, babies have surprisingly open-minded palates. Not to mention a keen ability to “chew” food even if they lack the hardware (a full set of teeth) to perform such tasks. When I was living in Japan, I was astonished to see babies snacking on dried fish and sea vegetables. Kids took bentos to school for lunch, filled with rice, fish or other protein, natto (fermented soybeans), etc. As if kids just want candy. Of course, if candy were constantly available, what kid wouldn’t eat it. We’re hard-wired to crave the sweetness. We’re not, however, designed to eat it round the clock. Nor are we designed to eat processed sweets or processed anything. We are lucky that we get our produce from an organic farm that is about 1 hour away. Local AND organic is a luxury that is difficult to find despite increasing numbers of farmers markets. Organic food is nutrient dense, it is real food and it is very important both personally and professionally, but that importance multiplies exponentially when I think about Claire eating. The produce from the CSA is slightly more bitter overall. It’s stronger in flavor and tastes like it just came from the Earth. It did! She eats whatever we get each week in our cherished box. She’s eaten most vegetables; beets, sweet potatoes, dark leafy greens from escarole and dandelion greens to spinach and chard, squash, potatoes, carrots, celery, corn, peas, etc. She also eats most fruit (no citrus or berries yet) and animal protein. Claire just isn’t into purees so I dice her veg and steam. For greens, I steam and then put them in the food processor. I then add a drop of olive oil or coconut oil to increase the bioavailability of the fat-soluble vitamins. She loves it. None of that advice was applicable to us, so I went to work. I began to give Claire raw coconut water daily. I gave her prune juice diluted in water. She ate plums for breakfast. I then made a prune and apricot compote (see recipe below). These all gave mild results. It wasn’t until I began giving her cod liver oil that her system got back on track. It honestly worked like a charm! I started by adding a 1/4t to her food which she ate with the same enthusiasm. Now she takes it by the spoonful (still 1/4t) before she eats. 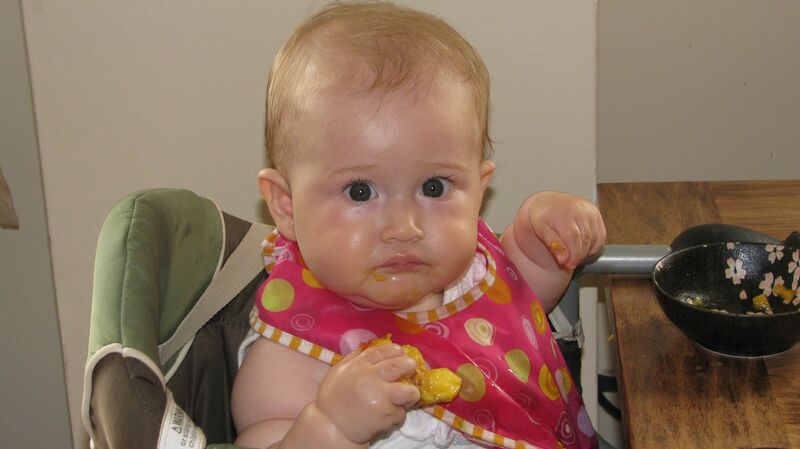 Introducing your baby to food can throw you for a loop. It threw me for one! There are so many rights and wrongs, so many opinions, comments, comparisons. What I have found is that following my instincts has served me well…so has following tradition. Claire eats the same food I eat. Bitter greens? Yup. 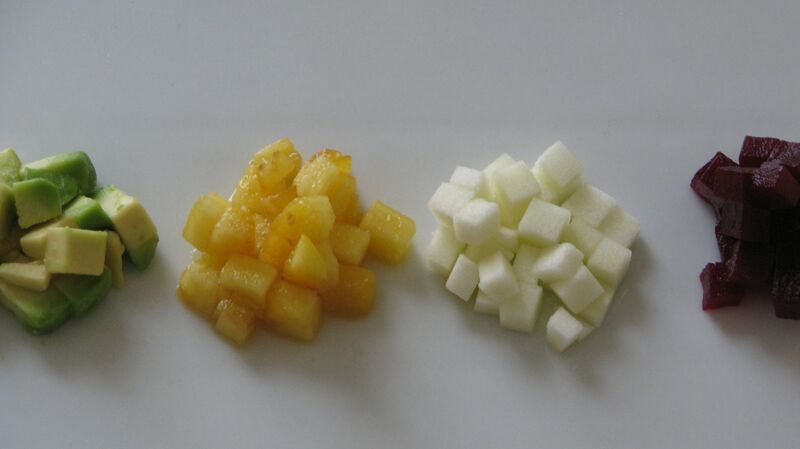 Sweet vegetables and tart fruit? Yes. Astringent vegetables, salt? Uh huh. I’m not sure that you’ll find what I’m doing in a book, then again, maybe you will. I’m just interested in maximizing Claire’s nutrition as well as giving her ample opportunities to explore different flavors. I’m not interested in “kid foods”. If we’re having salmon for dinner, she’s having some version of it, too. So far, so good. She loves meal time and kicks her legs and waves her arms in excitement as she sees her plate being prepared. I’m told this will change. Like all else in parenting, there is no such thing as linear progression and there will always be a ton of surprises! Let us know what you’re doing, what’s working and what isn’t. New moms can use all the support we can get! 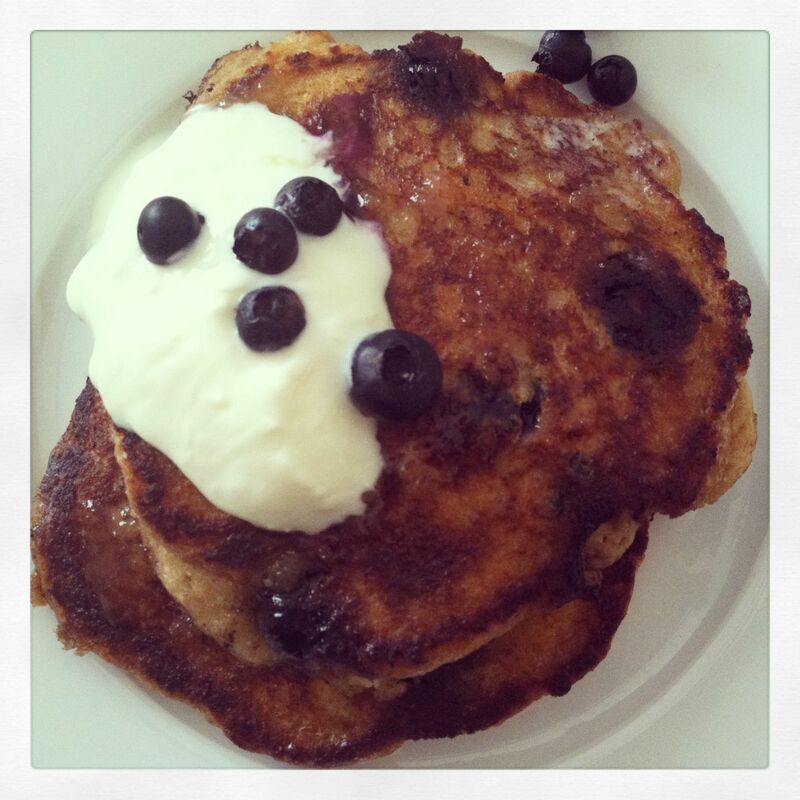 Enjoy your food journey with your little ones! 1. Soak the dried fruit and cinnamon stick in a sauce pan with enough (filtered) water to cover, overnight. 2. Remove the cinnamon stick and place saucepan over medium heat, bringing to a boil. Reduce heat to simmer and cook until the liquid becomes thicker and syrup-like. 3. Let cool and serve 1-2 T per sitting to baby. You can also mix with other foods such as sweet potatoes or spinach. Camera shy but loving that peach! *If you haven’t seen HBO’s Weight of the Nation, please do! **I should note that we LOVE our pediatrician, who is also an acupuncturist. There is a wide range of views held by the nurses in the office, however! That saying, “don’t plant zucchini unless you have a lot of friends” couldn’t be more true! They have a way of taking over a garden. Around this time, I am usually inundated with all kinds of squash from friends trying to unload. So when that happens, it forces you to get creative. Let’s be honest: How many stir-frys or pasta with sauteed squash can you possibly have? Baking muffins or a quick bread is an effective way of using some of your squash. Pickling them is also a great choice. (More on pickles in the coming weeks.) Shredding and adding to salads or sandwiches works, but so does converting them into fritters. 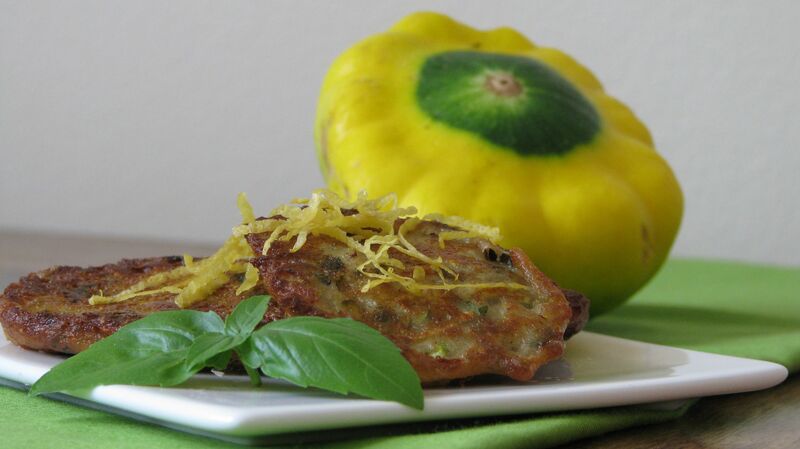 In our last CSA box, we got a boat load of squash and after said stir-frys and pasta dishes were done, I just threw what was left into the food processor and started adding goodies to create a fritter bursting with flavor but that was light as opposed to heavy and oily, despite being pan-fried. Seems impossible, but you’d be wonderfully surprised. Thinking about what to write about squash, I found that there’s not a lot of research done on the health benefits of squash, especially summer squash. They’re not dark leafy greens after all. Yet, they shouldn’t be ignored…how can they be ignored when they’re all over your garden or taking over your fridge?! And, that’s a good thing because they’re fiber rich which is good for gut and colon, and also means they’re protective against colon cancer. Fiber aids in digestion which helps move things, especially toxins, out of the body. They also help lower cholesterol and are anti-inflammatory, thanks to Vitamins C and A. As for minerals, magnesium and potassium make an appearance but the star of the mineral show happens to be manganese. Suddenly it seems like a good thing that these squash are taking over our gardens and refrigerators! 1. In a bowl, add the cheese, scallions, herbs, salt and pepper and combine well. Add the flour in steps, slowly incorporating it into the mixture and follow with the Parmigiano. 2. Add squash and eggs and stir well until thoroughly combined. 3. Heat 2 T of oil in a skillet over medium heat. Using a tablespoon to measure, drop batter into skillet and pan fry for 4-5 minutes before turning over and cooking for another couple of minutes until golden brown. Remove fritters and place on a wire rack over a sheet pan (alternatively, you could line a plate with paper towels, but they may get soggy this way) to cool slightly. Repeat and add oil as needed. *Chiffonade means to cut/slice into strips or ribbons as opposed to chopping which is more random. Basil lends itself to this cut. I haven’t gotten that far on the knife skills page, but I’ll get there! Red Quinoa, Corn and Peaches? Yes, most of the food that will make its way onto these pages will be optimal runners’ food…at least until the marathon in November. However, that doesn’t mean it isn’t optimal food for everyone. The more I cook for specific needs, whether it be to maintain wellness, to enhance a physical regimen, to curb an illness or to prevent one, I find that a lot of the same principles apply. Not all and not for everyone, but there are similarities. Why peaches? Honestly, because I didn’t have mango. And thank goodness I didn’t! I had beautiful peaches from our new CSA (I’ll be talking about this CSA a lot) and figured why not try it. 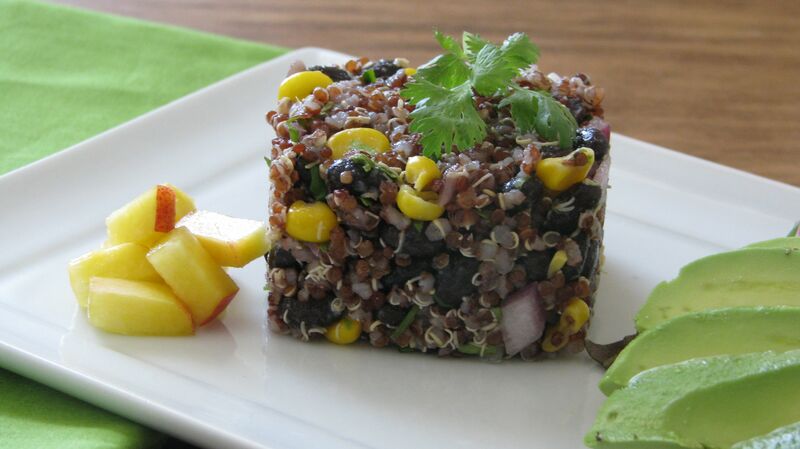 The sweet almost tart taste of the peaches plays so well up against the hearty quinoa, black beans and grilled corn. The texture combines beautifully, too. I surprised myself with the flavor of this salad. I love when that happens! 1. Rinse and soak the quinoa in a saucepan for 15 minutes. Drain and rinse again. Add 2 C water to quinoa and cook over high heat until it reaches a boil. Then, reduce heat to low, cover and let cook for 20 minutes or until the water has evaporated. Let cool. 2. Get the beans going! Drain, rinse and add beans to a saucepan with enough water to cover. Cook on high heat for 10 minutes while removing any foam that accumulates. Reduce heat to medium, add kombu and partially cover, cooking for 40 minutes or until just tender. (You don’t want them too soft, but these are dense little beans so make sure they’re all cooked through:) Drain and let cool. 3. If using, grill the corn. I leave the husks on when grilling (or you could roast like this too) for added depth in flavor. About 10 minutes on high is usually good. Make sure you rotate for even cooking. Remove husks and cut kernels off. Should yield about a cup. 4. Mix all dressing ingredients and whisk until thoroughly incorporated. 5. Mix quinoa and beans in a large bowl. Add corn, red onion, peach, cilantro and toss with dressing. 6. Let sit for about an hour in the refrigerator to let the flavors settle and to let the quinoa absorb the dressing. This salad is worth the wait!